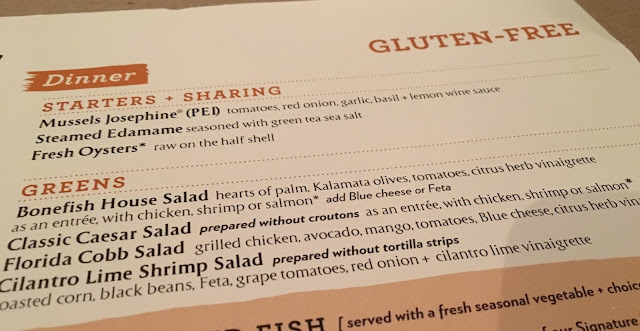 Once seated, I requested a gluten-free menu, and the waiter brought it over. See that in its entirety over on this post. 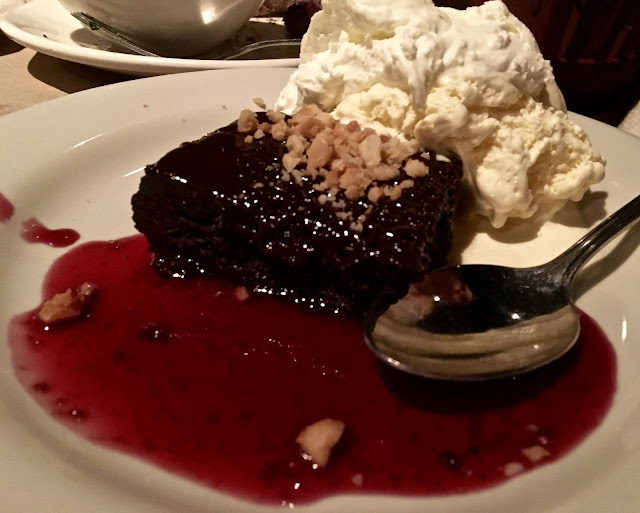 The offerings are pretty extensive, and even include dessert- a rarity when dining out with food allergies. Do note that Bonefish does not have a dedicated kitchen. When an allergy order comes in, it is flagged so that the kitchen is aware of protocols, but it's up to you to communicate with a waiter or manager before placing the order. Dairy does complicate the gluten-free menu. Obvious sources such as cheese on a salad can be avoided, but it also hides in more benign places such as the fish sauces (only mango salsa is safe), mashed potatoes, sweet potatoes, and other side items cooked with butter. Unfortunately, both desserts are also off limits for the dairy-free. I decided to order the shrimp and scallops. For the two included sides, I opted for french green beans and inquired about the sweet potato mash. Because the latter contained dairy, I opted for a double order of green beans instead. I'll admit right off the bat that I was a scallop newbie going in to the dinner. 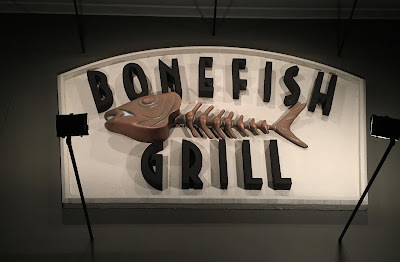 Without any prior experience with them, I was in love at first bite with Bonefish's simple, yet tasty take on the shellfish. 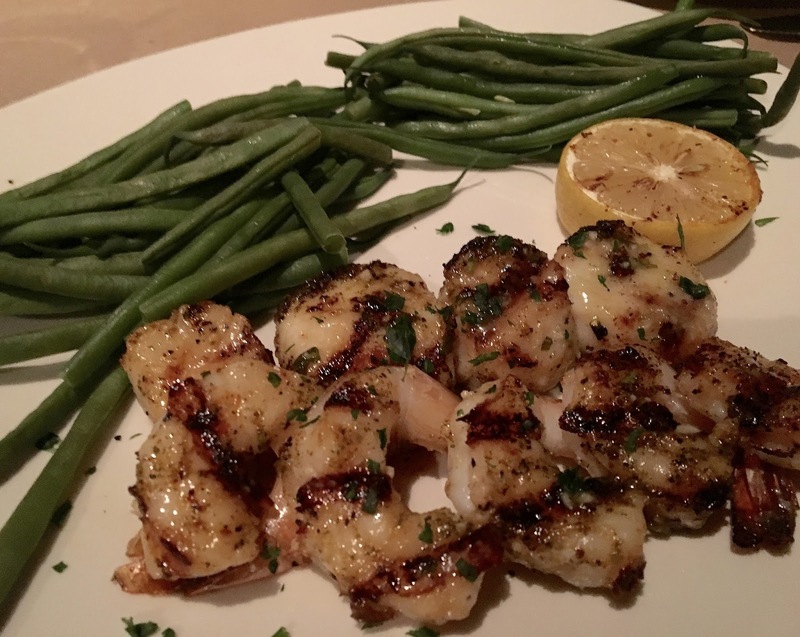 Chewy and tender, the scallops' flavor paired well with the accompanying shrimp, both benefiting from a squeeze of lemon and the seasoning. Though the portioning was a bit small, I relished every bite. The french green beans on the other hand left little to be desired. They were rather flavorless and dry- most likely a result of unsafe dairy or gluten seasoning or flavor enhancers. A drizzle of lemon juice spruced them up nicely, but overall I regretted ordering a double portion of the vegetable. Overall the shrimp and scallops stole the show and left me thinking of them long after the dinner was over. Limited by dairy, the expansive menu is a little limited with options, but overall Bonefish is a good choice for a nicer night out. Prices are expensive, but if you catch them on a night with specials, you do get your bang for the buck with food. Special Features: Make reservations online, simply look up your local restaurant here.